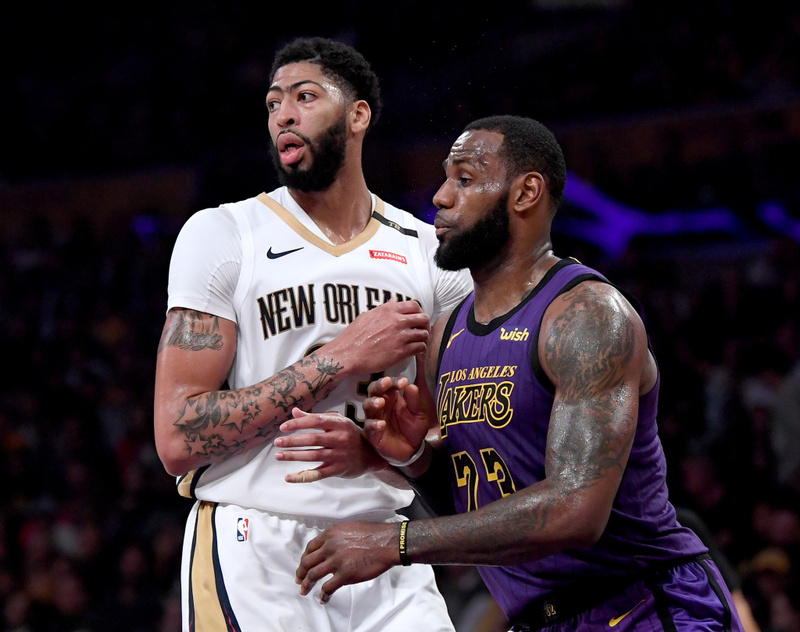 The Los Angeles Lakers already made the biggest splash of the NBA offseason when they signed LeBron James, and now they’re working to land themselves the biggest trade of the NBA season so far, as they are among the top suitors for New Orleans Pelicans forward Anthony Davis. The clock is ticking, however, as the league trade deadline is approaching at 3 p.m. Eastern Time on Thursday. The L.A. Times reported on Tuesday morning that Lakers president of basketball operations Magic Johnson had spoken to Pelicans general manager Dell Demps and had offered a total of six players, two first-round picks, and salary cap relief, though that offer has not been confirmed and the Times said the sources who provided that information were not authorized to discuss it publicly. The latest confirmed deal we know of was an offer that would have sent three young Lakers to the Pelicans -- guards Brandon Ingram and Lonzo Ball and forward Kyle Kuzma -- in exchange for Davis. In addition to other teams who are vying for the 6’10” all-star forward, there is also mounting pressure from within the Pelicans organization to keep Anthony Davis for the remainder of the season. If Davis isn’t dealt before the trade deadline, he will likely be among the top targets for teams during the off season. He turned down a 5 year, $239 million supermax contract extension offer from the Pelicans last summer, so there’s little doubt that Anthony Davis wants out of New Orleans. The question is whether Pelicans brass think they can get a better deal for him during the offseason if they hold off on trading him before the deadline. Known as “The Brow” for his signature unibrow, Davis has been an NBA all-star in six of his seven seasons in the league since he was drafted first overall by New Orleans, who were still the Hornets at the time, in 2012. Davis is averaging a double-double so far for his career at 23.4 points per game and 10.3 rebounds per game and is one of the league’s top young stars, making him a highly-coveted player across the league. This season, he’s second in the league in points per game, fourth in rebounds per game, and second in blocks per game. We’ll talk with “Take Two” host and KPCC’s resident Lakers guru A Martinez and the Lakers beat reporter at the L.A. Times about the latest on offers for Anthony Davis, the competing interests at play, and where the all-star could ultimately end up. Correction: An earlier version of this story incorrectly stated that Anthony Davis would be a free agent after this NBA season. Under his current contract, he won't be a free agent until 2020. We have corrected the story to reflect this and regret the error.